Tip: If you are replacing an old / existing 3 in 1 unit you will need to remove the old unit and measure the size of the hole. Once you have this simply use the below option to select an appropriate alternative! 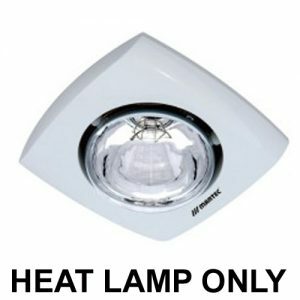 Welcome to our range of bathroom exhaust fans with light and heat lamps, also known as bathroom heaters. Bask in the warmth and glow of a 3 in 1 unit, these models can be very popular for bathrooms and toilets, especially in the cold winter months! 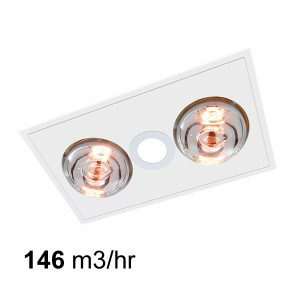 Heat lamps are designed to gently provide you with heat when positioned below them, the added integration of an exhaust fan and lighting element makes these units particularly practical! View the full range of bathroom heaters with light and extraction fan below. Mercator's latest addition to the 3-in-1 exhaust range is the Domino. 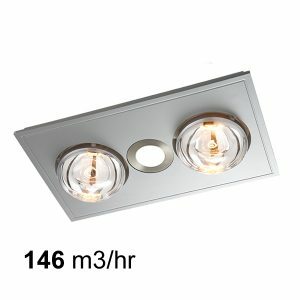 Its 800W heat lamp is framed by 2 x 10w LED lamps, creating an attractive 3 panelled facing. The included draft stopper prevents warmth from escaping through the side duct, allowing the Domino's heat lamp to create a cosy bathroom environment. This high capacity exhaust fan extracts up to 500m3/hr, making it a great 3 in 1 solution for bathrooms. The box includes a 1.5 metre length of flexible ducting with clamps, an external wall grille and a 3 gang switch wall controller. The Domino is driven by a 60 watt ball bearing motor and comes in 3 colours. Need Accessories? – Scroll to the bottom of the page to view suitable accessories including ducting and vents. The Ventair Airbus 3 in 1 unit has an extraction rate of 330m3/hr and a durable, ball bearing 65w motor. 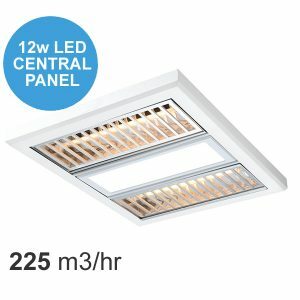 This exhaust fan features a central energy efficient 18w 4200k natural white LED panel with a Lumen rating of 1512Lm and two 600W radiant heating lamps. The Airbus 3-in-1 is side ducted accommodating 150mm diameter ducting and includes a draft stopper. The Sahara Exhaust Fan with heat and LED light features an LED light bordered by linear vents on either side. This chic design tops off a highly functional 3-in-1 model. Thanks to fan powered heating technology, the Sahara’s heater circulates warmth around the bathroom. For warmer climates, the Sahara’s fan operates independently of the heater – adding cooling functionality to the 3-in-1 model. With a 380 m3/hr capacity, the Sahara’s exhaust fan is also a strong choice for a clean and healthy bathroom. The Ventair Regent is a premium 3 in 1 unit that has an extraction rate of 225m3/hr and a durable 40w motor. 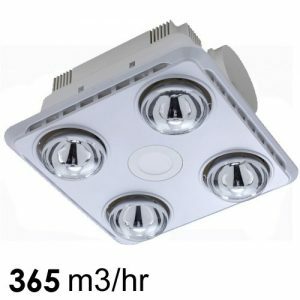 This exhaust fan features a central energy efficient 12w 4000k natural white LED panel at 1000 lumens and 2 radiant heating tubes at 500w each tube. This model is ideal for installation in bathrooms and ensuites where space is limited. 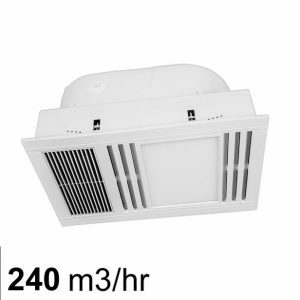 The Regent is side ducted accommodating 125mm of ducting (3 meters included with an external vent). The Ventair Klein is a basic 3 in 1 heater, light and exhaust unit which comes with ducting and an external vent. The Klein comes with a 4 gang switch which means you can control the exhaust fan, globe and heat lamps independently. The Ventair EKO2 is an energy saving 3-in-1 bathroom exhaust fan system providing heat and light along with the exhaust fan. The EKO2 comes with a 3 gang switch allowing for separate control of the exhaust fan, light and heat globes. The Ventair Brook 4 exhaust fan combines heat, light and exhaust in one sleek product. 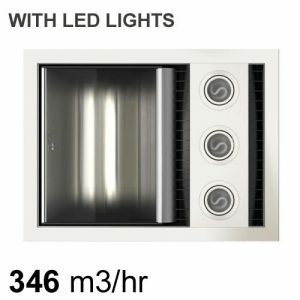 This Brook 4 exhaust fan features four heat lamps, a light and a high capacity exhaust fan. The Brook 4 is a great model for bathrooms. Ventair provide a three year warranty for this product. The Ventair Myka 4 exhaust fan combines heat, light and exhaust in one sleek product. The Myka 4 has a long lasting 28w ball bearing motor and reaches a noise level of 37 db(A). 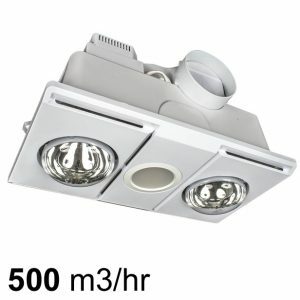 This exhaust fan includes 4 x 275w durable heat lamps and a 10w LED 4000k natural white light at 573 lumens. 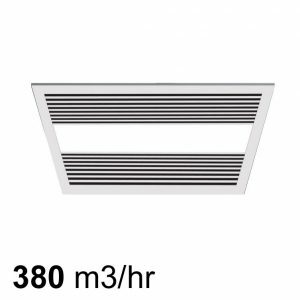 This exhaust fan includes 3 meters of aluminium ducting with a size of 125mm in diameter and an external vent. The Myka 4 is a great model for bathrooms and ensuites. The Ventair Myka 2 exhaust fan combines heat, light and exhaust in one sleek product. The Myka 2 has a long lasting 28w ball bearing motor and reaches a noise level of 28 db(A). 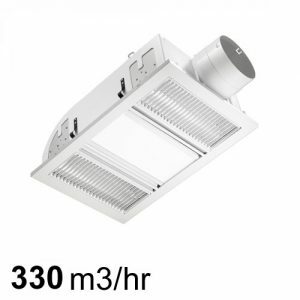 This exhaust fan includes 2 x 275w durable heat lamps and a 10w LED 4000k natural white light at 573 lumens. This exhaust fan includes 3 meters of aluminium ducting with a size of 125mm in diameter and an external vent. The Myka 2 is a great model for bathrooms and ensuites. The Ventair Brook 2 exhaust fan combines heat, light and exhaust in one sleek product. This Brook 2 exhaust fan features two heat lamps, a light and a high capacity exhaust fan. The Brook 2 is a great model for bathrooms. The IXL Tastic Neo exhaust, heat and light combo is a stunning new design from IXL. 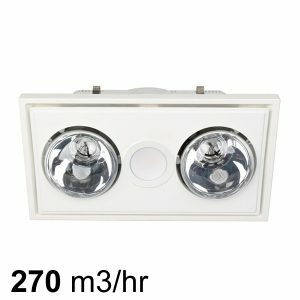 This recently upgraded model includes a more powerful inline motor and modern low wattage LED lights. The motor provided with this package is a high quality Ventair inline fan. A multi-function product, the Lava Quattro 4 exhaust fan not only removes moisture from the air but also provides light and heat. This exhaust fan is made by Mercator and forms part of the Lava range. This is an excellent Mercator bathroom exhaust fan that combines heat, light and exhaust all in one featuring a modern style. The Midas Duo includes a wall controller with 3 switches for separate heat, light and fan control. 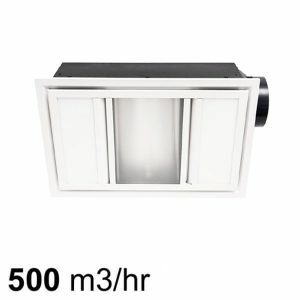 This is an excellent Mercator bathroom exhaust fan that combines heat, light and exhaust all in one featuring a modern style. The Lava Duo comes with a 3 gang switch included for separate heat, light and fan control. The Martec Profile Plus is a high airflow 3 in 1 exhaust fan (capacity 460m3/hr) with a high quality long life ball bearing motor. The Turbo fan blade ensures quiet and efficient operation. 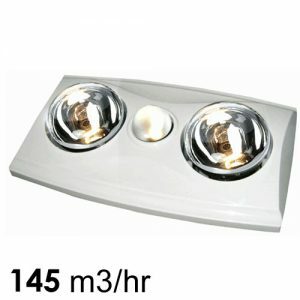 Includes 4 x 275w heat lamps with half or full heat functionality. The lights included are 4 x energy efficient 3000k COB GU10 LED. A 1 x 4 gang switch is included. The fan is also supplied with side ducting and a external grille. Martec's Contour 4 Bathroom Heater, Exhaust Fan and Light Combo features a stylish design. With a super slim slightly curved profile, it is ideal for contemporary bathroom designs and tastes. Comes complete with 4 x 275W Infra Red Heat Lamps, powerful and quiet Ball Bearing Turbo Blade Exhaust Fan, light globe, 4 Gang labelled switch, ducting and grill. The Contour 4 exhaust fan also has as standard included Half Heating Function. This package also includes a remote control. 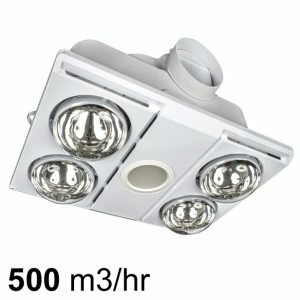 Comes complete with 4 x 275W Infra Red Heat Lamps, powerful and quiet Ball Bearing Turbo Blade Exhaust Fan, light globe, 4 Gang labelled switch, ducting and grill. The Contour 4 exhaust fan also has as standard included Half Heating Function. Featuring a slim profile, the Martec Contour 2 exhaust fan package is ideal for all contemporary bathroom designs and tastes. Suitable for small to medium bathrooms. This package includes the Martec remote control as pictured. 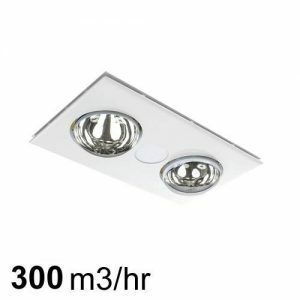 The Contour 2 bathroom exhaust fan is a 3-in-1 solution that comes complete with 2 x 275W Infra Red Heat Lamps, a powerful and quiet Ball Bearing Turbo Blade Exhaust Fan, 100W R-80 light globe, 3 Gang labelled switch, ducting and grille. It has a sleek design, perfect for modern homes. This packaged also includes a remote control. 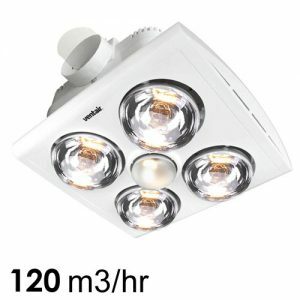 The Martec Contour 1 comes complete with 1x 275W infrared heat lamp. Featuring a super slim profile it is ideal for all contemporary bathroom designs and tastes. Suitable for bathrooms that require instant heat, the single heat unit gives you the flexibility of being able to place as many or as few heat units as required in strategic positions. 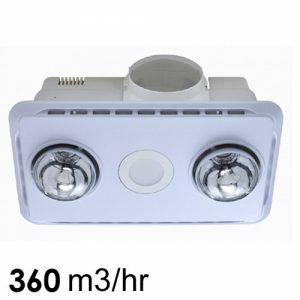 The Brilliant Horizon Heat Lamp 3 In 1 Exhaust Fan is an excellent 3 in 1 heater/light/exhaust fan for bathrooms. 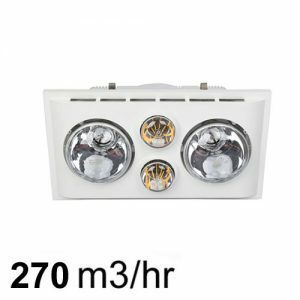 The unit features an 850 Lumen LED downlight producing a sharp 4200K cool white light output and 2 275W infra-red heat globes to warm your bathroom in the colder months. The Horizon 3 In 1 features a powerful 300m3/hr capacity exhaust fan to effectively clear steam and moisture from the room after a shower and is fitted with a thermostat switch for safety purposes, shutting the unit down if the internal temperature exceeds 80 degrees Celsius. Also included is a 3 gang wall switch for separate control of light, heat and exhaust. The Brilliant Supernova 4 Heat Lamp 3 In 1 Exhaust Fan is a suitable 3 in 1 solution for small and medium bathrooms. 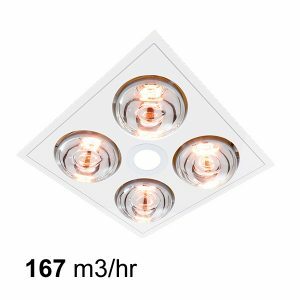 The unit features an 800 lumen Umbra-II LED downlight, 4 275W infra-red heat globes to warm your bathroom in the colder months and a 500m3/hr capacity exhaust fan to effectively clear steam and moisture from the room after a shower. A thermostat switch is installed in the unit for safety purposes, shutting the unit down if the internal temperature exceeds 90 degrees Celsius. The Brilliant Supernova 2 Heat Lamp 3 In 1 Exhaust Fan is a suitable 3 in 1 solution for small and medium bathrooms. 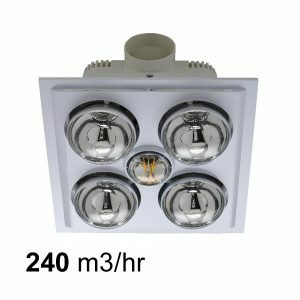 The unit features an 800 lumen Umbra-II LED downlight, 2 275W infra-red heat globes to warm your bathroom in the colder months and a 500m3/hr capacity exhaust fan to effectively clear steam and moisture from the room after a shower. A thermostat switch is installed in the unit for safety purposes, shutting the unit down if the internal temperature exceeds 90 degrees Celsius. The Andromeda by Brilliant is a powerful and efficient high quality 3-in-1 bathroom unit designed to suit small to medium sized areas. The unit features a dedicated low wattage 13w SMD LED panel light with 2x 1100W PTC ceramic heating elements to warm your bathroom on those cold mornings. The unit is fitted with a thermostat switch which will automatically turn on if the temperature exceeds 80 degrees. The unit comes with a three year replacement warranty. The fan also comes with 1.5m of ducting and an external vent. Please note that this fan is not designed for the heat and exhaust to operate at the same time.